Málaga is, for many, the main gateway to the region of Andalucía, but this youthful and energetic Mediterranean city is an attractive proposition in its own right. With an estimated 320 days of sunshine a year and a city centre packed full of historic and artistic attractions, Málaga offers the ideal mix of beach and culture. We have pick-up locations at Malaga Airport and at Malaga Railway Station. We’ll aim to get you into your rental car and on the road as quickly and as conveniently as possible. Whether it’s spending time soaking up the sun on its golden beaches or visiting the Picasso Museum, Málaga really does cater for all tastes. The winding streets in the heart of the city are lined with chic boutiques, tapas bars and cool cafés, while the waterfront has been revitalised with a promenade, bars, restaurants and shops. As you would expect in the birthplace of the 20th century’s most important artist, the city’s Picasso Museum doesn’t disappoint. Take a stroll through the cubist artist’s life with exhibits that chart his progress from the late 19th century until his death in 1973. The museum is a few minutes away from the house where Picasso was born, on Plaza de la Merced (also open to the public as a museum). A short distance from here is the superb Carmen Thyssen Málaga Museum where most of the works on display are from the 19th century, with the emphasis placed on Andalucían art. Malaga’s CAC – Contemporary Art Centre - has also gained quite the reputation internationally for the quality of its exhibitions. 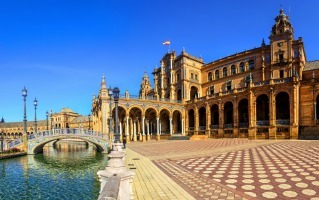 As if that weren’t enough, the city has three new artistic attractions: a branch of the St Petersburg State Russian Museum, showcasing art from the 15th to the 20th centuries; the Pompidou Centre, in a glamorous glass cube at Muelle Uno on the waterfront; and Málaga’s new Museum of Fine Arts and Archaeology. Standing on the site of Malaga’s main mosque, the city’s cathedral, built in the 16th century, is a glorious mix of Gothic, Renaissance and Baroque architectural elements. One of its towers was never completed, resulting in the iconic lop-sided effect you see today. Strategically situated overlooking the sea and the city, the Alcazaba is Málaga’s equivalent of the Alhambra in Granada. The fortress, built in the 11th century by Malaga’s Arab rulers, also served as a palace. Rising above the Alcazaba is the Gibralfaro castle, built in the 14th century to protect the fortress. Its outdoor café is a great place from which to enjoy the panoramic views. Málaga has no fewer than 15 beaches within its city boundaries and with your rental car you can explore other seaside delights along Spain’s sunshine coast. The pick of the urban beaches is Playa de la Malagueta, a 1km long stretch of sand nestled in a gently curved bay lined with shops and excellent fish restaurants. Less than an hour east on the A-7 is the charming former fishing village of Nerja which has several lovely beaches to choose from. The ever popular Playa Burriana makes a great lunch stop with its row of chiringuitos, or beach shacks, serving fantastic seafood. Drive 20 minutes north of the centre of Málaga and discover La Concepción, rated as one of the best botanic gardens in Europe. This tropical paradise, which combines formal gardens with a lush green forest, was created in the mid-19th century and is the perfect setting for a serene stroll. Just over an hour and half drive from Málaga is Granada, one of the most dramatic sights in all of Spain. Set on seven hills below the Sierra Nevada, the city is dominated by the magical Alhambra, a vast complex of stunning palaces, fortress and gardens and one of the best examples of Islamic architecture and craftsmanship in the world. Car rental in Málaga allows you to discover more of this magnificent destination and the must-see sights that surround it – all at your own pace. Driving in and around Málaga is a lot more relaxed than in larger cities such as Barcelona or Madrid. As a major tourist area, you’ll find many of the other drivers you encounter on the roads are also visitors, so are generally more cautious. Despite the slower-paced, mostly stress-free driving environment, it’s still important that you acquaint yourself with the rules of the road. Málaga Airport is 13km southwest of the city centre and around a 20-minute drive on the M-20. The main routes along the Costa del Sol are the A-7 and the AP-7, which is a toll road, or autopista. There are three types of main road in Spain. Carreteras nacionales are toll-free national roads with a speed limit of 90km/h, while autovías are toll-free expressways with a speed limit of 100km/h. Autopistas are toll highways with a speed limit of 120km/h (these roads are prefixed with an ‘E’). In Spain you drive on the right-hand side of the road and you should stick to the right-hand lane unless you’re overtaking. Note that though toll roads can be costly, they tend to be much quieter than toll-free roads. Much of Málaga’s centre is car-free, but finding a parking a spot isn’t usually a problem. There are large car parks near the main landmarks, such as the one at Alcazaba, which is handy for exploring the old town.